Have you heard about our new ChiroWay location opening this fall? We are excited to expand our ChiroWay community with a center in North St. Paul, Minnesota! Mike Madison, DC, joined ChiroWay Franchise in 2012 as owner and chiropractor of ChiroWay of the St. Paul Skyway. ChiroWay of North St. Paul will be Mike’s second office in the Twin Cities area and is projected to open in November 2018. Mike grew up in Sherburn Minnesota, a small farming community in Southern Minnesota. After graduating high school, he ran track at the University of St Thomas. During college, he stumbled upon chiropractic care, which helped him perform better in track and in school, this helped him make the decision to become a chiropractor and attended Northwestern Chiropractic College in Bloomington, Minnesota. Following graduation, Mike did an internship at a chiropractic center on the west coast. He then decided it was time to come back to Minnesota, where he practiced in the Twin Cities. It was during this time that he found ChiroWay. 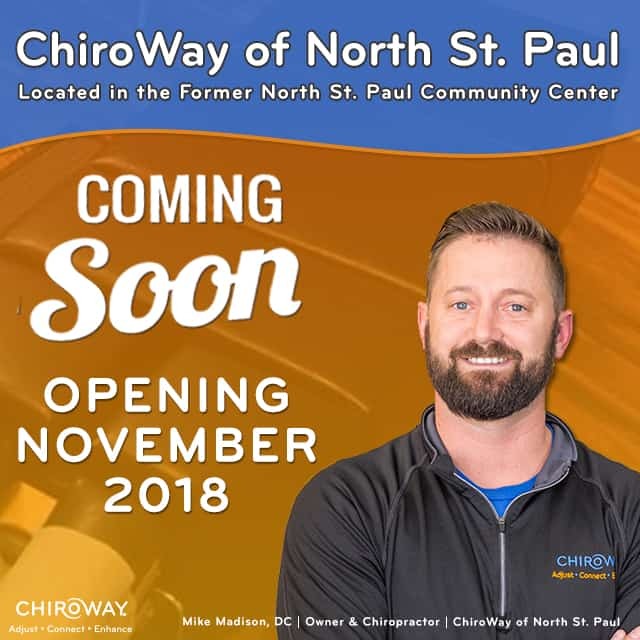 Mike is proud to provide regular chiropractic care in the St. Paul Skyway and looks forward to opening his second ChiroWay Center in North St. Paul to serve even more people in the surrounding community. Interested in learning more? Click the link below to sign up to receive updates on our newest office, and be sure to share with friends and family who live in the area! Get more info on ChiroWay of North St. Paul!